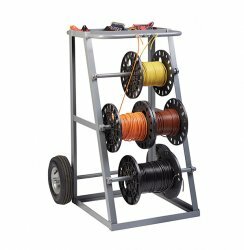 Model:RT3-12P Heavy-Duty Reel Caddy Size 1,000 lbs. Capacity 12" Pneumatic casters Three (3) heavy-duty steel spindles are 1" diameter bar stock secured with set screws, and will accept reels up to 12" diameter and 21" wide. For larger diameter spools, simply remove 1 or more of the spindles. Large 12" diameter pneumatic wheels have roller bearings for transporting over rough surfaces. Save space, use and store vertically or horizontally. Capacity 150 lbs. per spindle. Three wire guides for dispensing. Convenient top tray measures 10" x 24". Welded unit has a powder coated finish and ships set up and ready for immediate use.